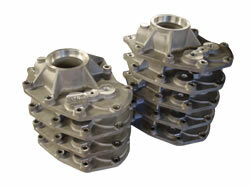 Gearbox rebuilds were one of the first services that we decided to offer to the classic Jaguar enthusiast. We can work on any manual transmission, but prefer to concentrate on the earlier double-helical gear models fitted to pre-1947 models. We have also developed a hybrid single-helical gearbox for SS100 models, utilizing our original pattern remanufactured backplate and later XK-type gearsets for enhanced reliability in these highly desirable motorcars.